This is a small wild orchid, Spiranthes cernua, that blooms in fall and again in spring. It is about the height and delicate size of lily-of-the-valley. There are several similar species, but they are either taller, or fragrant, or both. This one is called Nodding Ladies Tresses, and some of the others have beautiful common names too – Southern Slender Ladies Tresses and Lace-Lip Ladies Tresses. I don’t see anything particularly “tress-like” about the shape of these flowers, but I think “bonnet” and “bell” had been used so much in flower names, that they had to come up with another term. 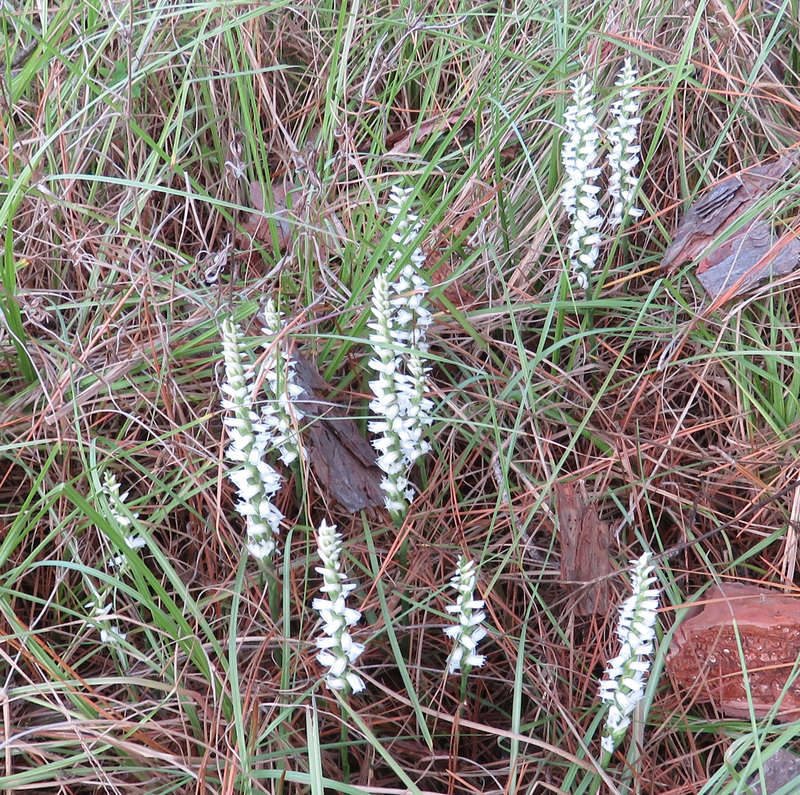 A very similar species that grows near here is called Navasota Ladies Tresses, Spiranthes parksii. It is endangered, and once I volunteered to go out with a survey team to find and mark the plants’ locations. I learned a lot, and one thing I learned is that I prefer walking around in pine forests which are nice and open at ground level, to walking around in hardwood forests where the tree limbs grow in every direction including down. I did a lot of ducking that day and I could never see where I was going! But now when I see these plants I always double-check them, to make sure they are the ordinary, non-endangered ones. Spiranthes cernua, Nodding Ladies Tresses. Close-up of the wild orchid. The book Wild Orchids of Texas (by Joe Liggio and Ann Orto Liggio, 1999, University of Texas Press) tells me there are 54 species in Texas. Someday, when I’ve seen all the birds of Texas, I will set out to see all the orchids too!